Protesters angry over an Israeli airstrike in Qana that killed up to 50 refugees broke into the main U.N. building in the Lebanese capital Sunday, burning U.N. and American flags. Around 500 protesters massed outside the building, which was empty on the weekend day. Some pushed through police barricade, smashed windows and broke inside the building. An Israeli airstrike Sunday killed at least 50 people - more than half children - in a southern Lebanese village, the deadliest attack in 19 days of fighting. Secretary of State Condoleezza Rice postponed a visit to Lebanon. Infuriated Lebanese officials said they had asked Rice to postpone the visit after Israel's missile strike. But Rice said she called Lebanese Prime Minister Fuad Saniora to say she would postpone the trip, and that she had work to do in Jerusalem to end the fighting. She said she was "deeply saddened by the terrible loss of innocent life" in Israel's attack. But she did not call for an immediate cease-fire in the fighting between Israel and Hezbollah militias. "We all recognize this kind of warfare is extremely difficult," Rice said, noting it comes in areas where civilians live. "It unfortunately has awful consequences sometimes." "We want a cease-fire as soon as possible," she added. The United States and Israel are pressing for a settlement that addresses enduring issues between Lebanon and Israel and disables Hezbollah - not the quick truce favored by most world leaders. Saniora said Lebanon would be open only to an "immediate and unconditional" cease-fire and called for an "international investigation of the Israeli massacres in Lebanon." Israeli Prime Minister Ehud Olmert said Israel would not rush into a cease-fire until it achieved its goal of decimating Hezbollah, whose July 12 capture of two Israel soldiers provoked the fighting. The missiles destroyed several homes in the village of Qana as people were sleeping. The bodies of 27 children were found in the rubble. The Israeli army said it targeted Qana because rockets have been repeatedly launched from the area into Israel. Qana was the launching point for 40 Hezbollah rockets that hit northern Israel early Sunday, military officials said. Israeli medics said five Israelis were injured in the attacks. Israel said it warned civilians several days ago to leave Qana. "This is an area of combat - it was declared as such several days ago," said Israeli Army spokesman Capt. Jacob Dallal. "Most of the people in the area have left and heeded our call." Lebanese Defense Minister Elias Murr questioned Israel's claim that Hezbollah fired rockets from the village. "What do you expect Israel to say? Will it say that it killed 40 children and women?" he told Al-Jazeera television. Rescuers aided by villagers dug through the rubble by hand. At least 20 bodies wrapped in white sheets were taken away, including 10 children. A row of houses lay in ruins. An old woman was carried away on a plastic chair. Villagers said many of the dead were from four families who had taken refuge in on the ground floor of a three-story building, believing they would be safe from bombings. "We want this to stop!" shouted Mohammed Ismail, a middle-aged man pulling away at the rubble in search for bodies, his brown pants covered in dust. "May God have mercy on the children. They came here to escape the fighting." "They are hitting children to bring the fighters to their knees," he said. Qana, in the hills east of the southern port city of Tyre, has a bloody history. 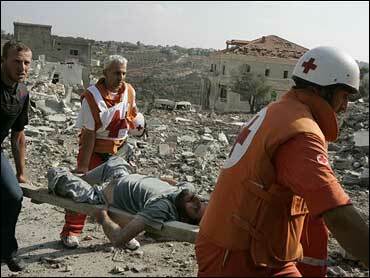 In 1996, Israeli artillery killed more than 100 civilians who had taken refuge at a U.N. base in the village. That attack sparked an international outcry that helped end an Israeli offensive. Lebanese civilians have suffered the most from the fighting. Before Sunday's attack, Lebanese officials said 458 Lebanese had been killed, most of them civilians. Thirty-three Israeli soldiers have died, and Hezbollah rocket attacks on northern Israel have killed 19 civilians. Fighting also broke out between guerrillas and Israeli soldiers in a zone called the Taibeh Project area, about 2 miles inside Lebanon. The Israeli army said one soldier was moderately wounded. Hezbollah's al-Manar TV claimed two Israeli soldiers were killed. Heavy artillery rained down on the villages of Yuhmor and Arnoun, close to Taibeh. In northern Israel, rockets fell on Nahariya, Kiryat Shemona and an area close to Maalot, the army said. Israel has said it would launch a series of limited ground incursions into Lebanon to push back guerrillas, rather than carry out a full-fledged invasion. Israeli troops pulled back Saturday from the town of Bint Jbail, suggesting the thrust, launched a week ago, had halted. But Lebanese officials reported a massing of troops and 12 tanks near the Israeli town of Metulla further to the northeast, on the tip of the Galilee Panhandle near the Golan Heights, suggesting another incursion could begin soon. "I think it needs to be clear that Israel is not in a hurry to have a cease-fire before we reach a situation in which we can say that we achieved the central goals that we set down for ourselves," Olmert said Sunday before his weekly Cabinet meeting. U.S. Secretary of State Condoleezza Rice returned to the Middle East Saturday, but peace did not come with her. Hezbollah leader Sheik Hassan Nasrallah marked Rice's arrival with a threat to fire rockets even deeper into Israel. Appearing on Hezbollah television, Nasrallah claimed victory, saying Israel had failed to make a "single military achievement" during its 18-day offensive. On the same day, the Israeli planes continued their bombardment of Lebanon while the army drew some of its ground forces back from the front lines. Israeli troops killed two Islamic Jihad militants on Saturday, including the man the group described as the leader of its militant wing in the West Bank city of Nablus. Israel rejected a request by the United Nations for a three-day cease-fire in Lebanon to get in supplies and allow civilians to leave the war zone. Avi Pazner, a government spokesman, said Israel already has opened safe corridors across Lebanon for such shipments and that Hezbollah guerrillas were blocking them to create a humanitarian crisis. CBS News national security correspondent David Martin reported that Israel has made so little progress in destroying Hezbollah that some U.S. intelligence analysts now say the attempt to create a buffer zone in southern Lebanon has bogged down. "It doesn't appear they've been able to claim the territory they want to claim," one intelligence official told Martin. A Middle East policy analyst said that that he thinks the United Nations has a chance of producing a resolution that can lead to a cease fire. "There's been a surprising amount of agreement about the elements that would go into a cease-fire package," Martin Indyk, director of the Saban Center for Middle East Policy at the Brookings Institution and former U.S. ambassador to Israel told to CBS Evening News anchor Bob Schieffer. President Bush said Friday that he and British Prime Minister Tony Blair agree that a multinational force must be dispatched quickly to the Mideast fighting, and said they will work for a U.N. resolution to support it. Both men addressed the loss of public support of critically important moderate Arab leaders, reported CBS News chief White House correspondent Jim Axelrod. Israeli troops pulled back from a border town Saturday after a week of heavy fighting with Hezbollah guerrillas, and warplanes killed a woman and her five children in a strike that leveled their home. Hours after the pullback was announced, an Israeli force massed on their side of the border further to the east, across from the Lebanese town of Khiam, Lebanese security officials said early Sunday. The move raised the prospect of a new large incursion into Lebanon. The weeklong battle at Bint Jbail underscored Israel's difficulty in pushing back guerrillas who have been preparing for years for this fight, building up arsenals and digging in with tunnels and shelters in caves. Maj. Gen. Udi Adam, head of Israel's northern command, said Israel never intended to occupy Bint Jbail or to get "stuck in one place." He insisted the real mission — "to destroy infrastructure and kill terrorists" — had been a success. Regardless, the pullback gave Hezbollah the opportunity to claim its fighters had driven out Israel's war machine. Nasrallah said his guerrillas had dealt Israel a "serious defeat" in the town. "This elite force was fleeing and scurrying like mice from the battleground," he said. Even Israeli officials said the battle was tougher than expected in Bint Jbail, a mainly Shiite town with deep symbolism for Hezbollah. Nicknamed "the capital of the resistance," the town showed vehement support for the guerrillas during the 1982-2000 Israeli occupation of the south. Eighteen soldiers were killed in Bint Jbail — nine of them in Hezbollah ambushes Wednesday, the military's worst one-day loss in the campaign. Adam said dozens of guerrillas were killed in the week of fighting. But Hezbollah acknowledges the deaths of only 35 fighters in the entire 18 days of warfare. Nasrallah, the bearded Shiite Muslim cleric, wearing his trademark black headdress, gave his latest televised address a day after Hezbollah fired its deepest strike in to Israel yet, hitting outside the town of Afula. "No matter how long the war lasts, whatever sacrifices it takes, we are ready. We will not be broken or defeated," he said. "Many cities in the center (of Israel) will be targeted ... if the savage aggression continues on our country, people and villages." Despite its intense bombardment of Lebanon — and heavy ground fighting near the border — Israel has been unable to stop barrages of hundreds of Hezbollah rockets. Guerrillas fired about 90 rockets into Israel Saturday, lightly injuring five people. Throughout, Lebanese civilians have suffered the most from the fighting, which erupted after Hezbollah kidnapped two Israeli soldiers and killed one in a cross-border raid July 12. A strike outside the market town of Nabatiyeh crushed a house, killing a woman and her five children, and a man in a nearby house, Lebanese security officials said. Elsewhere, six bodies were dug from the rubble of a house destroyed Friday in the town of Ain Arab, they said. In the southern port city of Tyre, volunteers buried 31 victims of the bombardment in a mass grave. Among the line of plywood coffins was a tiny one holding the body of a one-day-old girl. At least 458 Lebanese have been killed in the fighting, according to a Health Ministry count Friday based on the number of bodies in hospitals, plus Saturday's deaths. Some estimates range as high as 600 dead, with many bodies buried in rubble. Thirty-three Israeli soldiers have died, and Hezbollah rocket attacks on northern Israel have killed 19 civilians, the Israeli army said.